For those of you who wanted a white Christmas….you got it and then some. Up to two feet of snow fell in Ocean County over the weekend and the digging out continues from an epic storm that was much more severe here then in the northern part of the state. Most schools are closed today as they needed more time to clear busses and plow parking lots while local towns still have a lot of work to do, especially on side streets. However give credit where its due as many of the main roads were in very good shape yesterday morning. After spending about two hours shoveling we got out early in the afternoon and it was a pleasure hitting some stores because they were pretty empty. Of course this weekend was the last before Christmas and the snow storm was not what retail stores and restaurants had in mind but here’s hoping they get some of it back this week. About the only beneficiaries of the storm were private owners of snow clearing equipment, some of whom have been waiting years to get at least some of their investment back. They did this weekend and considering winter does not officially begin until 12:47 this afternoon many are probably optimistic that this could be the year they actually make money. We made the decision early in the afternoon on Friday to postpone the first round games in the 26th Annual WOBM Christmas Classic which were scheduled for Saturday and Sunday at the Ritacco Center. With the cooperation of Athletic Directors and others we have now moved those games to Tuesday and Wednesday. The Boys play tomorrow beginning at 3pm with defending champion Point Boro meeting Lacey in the Toms River North gym and at the same time in the Poland Spring Arena Southern will take on Wall. There will be six other boys’ games tomorrow and then on Wednesday the Girls play their first round games starting at 3pm. The complete schedule is available at wobm.com (wobmam.com). Some things never change. The New York Jets always find a way to lose an important game that they need to win. My biggest problem with this entire Tiger Woods mess is trying to separate fact from fiction and no matter how much you read, listen and watch you’ll likely come away with more questions than answers. Last night I just happened to be home and my wife and I watched back-to-back entertainment shows on TV. I don’t remember the names but you know what I mean…those 7 and 7:30pm programs that are pretty much 30 minutes of Hollywood sleaze. On more than one occasion we looked at one another and just laughed at what we were hearing and seeing. It’s almost comical because the hosts of these shows at times try and come off like this is real news and they are real newscasters. I’m sure even they don’t know if what they are reporting is true or just rumor, innuendo and speculation. What I can tell you is this. We’ll be subject to non-stop Tigermania until Woods himself gets in front of a camera and addresses the issues head on. Of course in watching TV last night I was told that Tiger is either getting his yacht “Privacy” ready for a sailing with one of his alleged gal-pals, or might be heading to France while his wife Elin is contemplating writing a book or going on “Oprah.” Remember though that was last night and tonight will bring more stories for sure. Phillies announced yesterday that the 48-year Parent old will replace Dusty Wathan, who guided the BlueClaws to their second South Atlantic League Championship in September and has moved up in the organization. Several weeks ago Manchester Township’s Jimmy Lawson was a guest on our Thursday Night Football Show and said he was planning to go to Rutgers University and wrestle for Coach Scott Goodale even though there were many schools interested in him as a football player. Lawson has had a change of heart and has announced he’s headed to Monmouth University to play football for Coach Kevin Callahan and the Hawks. Kudos to the Central Regional High School Board of Education for finally finding a way to replace the 53-year old bleachers on the school’s football field. Better late than never. 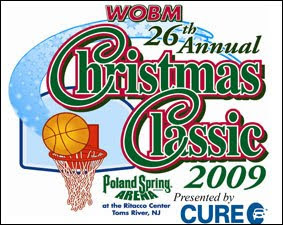 To some the WOBM Christmas Classic is just another one of those sporting events that appears during a crowded holiday calendar. Sure it’s been around for a while (26 years), has a lot of basketball teams (32) and is played in a large venue (The Ritacco Center in Toms River). However if you ask some of the participants they might tell you the highlight is the “Tip Off” Brunch which took place yesterday at the Quality Inn of Toms River. Some 268 people, most of them hungry teen-agers consumed plates of eggs, potatoes, French toast, bacon and enough sausage links to form a line between the Ritacco Center and back. Okay that’s a bad joke, one of several I told during the event which officially begins our annual basketball tournament. Actually we really got underway on Sunday night when the 32 coaches gathered at Klee’s Bar & Grill in Seaside Heights for dinner and the task of seeding the teams which determine the pairings. They left without knowing the results which I announced during Monday’s breakfast. For now the headlines go to a little of the old and a little of the new. Defending champion Rumson-Fair Haven, winners of 5 of the last 8 WOBM titles, are the top seed in the Girls Division and many expect they will battle #2 Southern in the final for the second straight year. The Bulldogs begin their bid for the title against Lacey Sunday at 6:45pm in the Poland Spring Arena which is just a half-hour after Southern tips-off with Monsignor Donovan across the hall in the North Gym. Wall & Point Boro round out the top four seeds in the field of 16. On the boys side its newcomer Monroe who grabs the top spot and will meet another first-year entry Barnegat on Saturday at 6:45pm in the final game of the opening day. St. Rose is the #2 seed and will face rebuilding Toms River North on Saturday night while Manchester and Toms River East fill out the top four spots. Defending champion Point Boro plays Lacey at 1pm Saturday in the first of the 52 games over 7 days that will be played before a champion is crowned on December 30th. The complete schedule and brackets are available at shoresportsnetwork.com. Walt Peto, who retired recently from the Toms River Regional Schools, received the “Jim Ruhnke Award” during the breakfast for his contributions to the tournament. Peto has been involved as a coach, Athletic Director, parent and now tournament staff. Assistant Superintendent Michael Citta welcomed the players and coaches to the event, which moved to the Ritacco Center from Ocean County College in 2003. There is a pretty decent chance you have heard about Kevin’s Kids which was founded and is run by Kevin Burger, an administrator in the Manchester Township School District. It’s the most extraordinary example of the goodness that can come during the holiday season and brings together what’s now hundreds of volunteers united in their desire to make the Christmas season a bit brighter for those less fortunate. It all started 27 years ago when a teacher told Burger what one of her first grade students said when asked what gifts he had received for Christmas. “Santa doesn’t come to our house” was the youngsters reply and from that story Kevin’s Kids was born. Burger and his wife Peggy may be the architects but they have plenty of support both inside and outside the Manchester School District. It begins months in advance when they identify those in need of help during the holiday season. Over the years getting names has not been a problem but the real challenge is to fill the wish list of families, some of whom are asking for basic needs like winter coats in addition to games, toys, bicycles and more for their children. Fundraising takes place throughout the fall and is made up of everything from school events, promotional nights at restaurants, direct donations and more. Then came the very organized chaos of this weekend with began with a shopping spree on Saturday morning to Toys R Us and Target. School busses filled with volunteers armed with shopping lists flocked to the stores and hours later those items were taken to the Manchester Middle School where squares were marked on the gym floor with the names of the families to be helped. Sunday a crew would arrive to do all the wrapping and what a sight to see…about 200 volunteers wrapping presents for those they don’t even know. What has always struck me is the volunteers come from all walks of life. Many of course are teachers and staff plus their families from the school district but there are so many others from the Wall High School Ice Hockey team to local senior citizens, from residents Pat and Lori Barry to Kim Peto, who started helping when she played basketball at Toms River North and is now a teacher and coach herself. Last night after all the volunteers had left the parents who benefit from this outpouring of generosity arrived to collect all the goodies which they will put under Christmas trees so their children don’t have to say “Santa doesn’t come to my house.” The final numbers from this year’s effort…Kevin’s Kids assisted a record 385 families by collecting $43,000 to shop plus throw in another $20,000 in donated items. All of those who helped in some way truly know that it is better to give than receive. It seems like every time you turn around these days you see or hear about an organization collecting toys, food, clothes and more for those less fortunate during the holiday season. The good news is there are so many efforts to help others….the bad news is there are so many in need right here in Ocean County. The Hope Center is a non-profit organization founded by the Clergy Association of Greater Toms River which benefits both Christian and Jewish congregations. Their mission is to provide resources, referrals, food and targeted financial assistance to clients as they work to overcome a current life crisis. Located at The House of Hope in Toms River, since opening 18 months ago the Hope Center has assisted more than 2000 families and individuals. An agency of the United Way of Ocean County they have trained staff and volunteers who help clients find out what county and state social service programs might be available to them. Much of their focus centers on issues like housing, utilities and urgent needs. Now that you know a little about them here is their dilemma. Their funds have basically been depleted and exhausted and as I speak they have about 300 children on their Christmas list. The greatest need is to help the pre-teen through 17 year old age group and the Hope Center is asking for donations of cash/checks or gift cards. If you can make a donation by next Wednesday (December 16th) it would be greatly appreciated as the following day is their Christmas give-away. You can drop off a donation at The House of Hope, 253 Chestnut Street in Toms River or call them at (732) 341-4447. Like I said in the beginning…there are many worthwhile organizations seeking to make the holidays just a little bit brighter for others…the Hope Center is one worthy of your consideration. On an unrelated note…The Shore Sports Network All Ocean and All Monmouth County football teams have been announced and can be viewed at shoresportsnetwork.com. Special congratulations to Players of the Year Nico Steriti of Toms River East and Jared Allison of Matawan along with Coaches of the Year Charlie Diskin of the Raiders and the Huskies Joe Martucci. The teams were selected in conjunction with the head coaches in the Shore Conference. Follow-up to yesterday’s segment on our family history with putting up and decorating live Christmas trees. First I want to thank those who told me hearing about the problems we’ve had with tree stands and trees falling over reminded them of their own woes. Kristine from Point Pleasant said their solution was to screw a hook into the wall and wrap heavy-duty line around the tree and tie it to the hook which now stays in the wall all year long. By the way we did decorate the tree last night and it looks marvelous. Central Regional High School wrestling Coach Mike Bischoff announced this week that the school’s annual JV Wrestling Tournament will be re-named in honor of Jerry Golembeski, who was the school’s first wrestling coach and also long time Athletic Director. The tournament will be held on Saturday, December 20th and Golembeski will be honored at the event. It’s a fitting tribute to a man who gave much of his adult life to the Golden Eagles. Southern Regional High School has announced plans for its 21st annual Hall of Fame Induction Ceremony which will be held on Sunday, February 21st at the Holiday Inn of Manahawkin. This year’s inductees are Dan Rodman, Stephanie Rieser, Neil McCallum, Lauren Lewis, Anthony Campanile and Coach Tony Sermarini. The 2002 Group 4 State champion Golf Team will also be honored. For ticket information you can contact Sue Sharkey at the high school or via email at ssharkey@srsd.net. Our friends at Wallach’s Farms on Route 9 in Toms River will be getting a visit from Santa, Mrs. Claus and some of their friends on Saturday from 9am to noon. Kids are invited to enjoy free pancakes and drinks while dining with Santa at Wallach’s. The Shore Sports Network officially ends its coverage of the high school football season tonight with the final “Thursday Night Football Show” at Boston’s Restaurant in Toms River. The show can be heard on 1160 WOBM AM from 6-8pm and also on line at shoresportsnetwork.com. Tonight’s finale will center on the announcement of our All Ocean and All Monmouth County Football Teams as well as players and coaches of the year. Nothing against artificial Christmas trees but in our house it’s real or it’s not a tree. I’m sure just about everyone at one time or another has had a live tree but you may have forgotten the challenge that sometimes comes with putting one up. We in the Williams Family have had a somewhat checkered past when it comes to the real deal but continue to write new chapters as opposed to taking the easy way out and going artificial. For quite a while the problem was always the tree stand. You might remember that years ago they pretty much made only lightweight ones which were fine for a tree with a small or average base. However we would usually end up with Douglas-firs in which the base did not fit into the stand and often I would have to chop away at the bottom with a saw or even an axe to make it smaller. We would then squeeze it into the stand but usually there was simply too much weight and alternative measures were needed. The height of what seemed like annual adventure came in 1992 when our children were 7 and 1. We finally got the tree up and decorated but in the wee hours my wife Jane awoke to the sound of the tree crashing to the floor. It was utter chaos as we first had to clean the mess and then try and get it back up and re-decorated. We managed to do this without waking the kids and everything seemed in control. I showered, dressed and left for work but just as I was backing the car out of the driveway Jane opened the door and screamed to me “it fell again.” I could go on and on but my eventual solution was to nail the tree stand right into the floor through the carpet. Things have improved dramatically because they now make these heavy duty stands which can hold a redwood. The last few years have been smooth sailing but this year we ran into a different obstacle. We put our tree up last week but usually wait a day before decorating. Jane was concerned that the tree was not taking any water so after 4-5 days and fearing a fire hazard she insisted we return the tree which we did last night to the place where we’ve purchased them for about 20 years. The owner explained that because the Douglas-fir she purchased had been cut that day and came right off the truck it would not need or take any water for a week or two but it didn’t matter. We now have a Fraser fir standing in our living room which will be decorated tonight…I think. Artificial may be easy but it comes without any adventure plus it doesn’t smell like a Christmas tree. Maybe next year we should try for the Festivus Pole. Have you ever given serious thought to how much of our daily life is based on a routine that rarely changes except during holidays, vacations and the like? This certainly applies to anyone who wakes up in the morning to an alarm clock because that’s the start of the routine and sets off a series of events that are pretty much the same all the time. Assuming you have a job that forces you to leave home or have a job that centers around getting everyone else out of the house your morning time often depends on you performing a certain function at a certain time. Its amazing how your entire day can get thrown off if something develops which alters your routine by even just a few minutes. We have become conditioned to this routine and can become frazzled, especially when outside forces throw everything off. and are stuck in this routine. Those who commute in the morning could miss their bus or carpool or just as bad get stuck in traffic that they usually avoid by leaving early. Parents getting children off to school may have to scramble to get them to the bus on time. There are countless examples of where just a few minutes can throw you out of balance and it could have an impact for the rest of the day. I can’t tell you how many people have said to me that listening to the Hometown View is a reminder of where they need to be in terms of their morning routine. Some say it’s their own version of an alarm clock as they get out of bed when I’m finished or walk out the door to work. They also blame me when I’m not here and there is no segment to serve as their reminder. Anyway I’m locked in to a routine that gets me to my Dunkin Donuts pretty much within five minutes of the same time every weekday morning. Heck I don’t even have to order my large coffee with cream and two splendas because when I pull up to the drive-thru my regular guy simply says, “pull around boss.” He knows and I know and you know….routines may sound boring but they are a part of our life. For most of us the two dates that will forever remain etched in our minds are September 11th and December 7th although the younger generation may need a reminder on the later date. Today is the 68th anniversary of the Japanese attack on Pearl Harbor which claimed the lives of 2,400 and the next day led President Franklin Roosevelt to declare war on Japan as he proclaimed “December 7th, 1941, a day which will live in infamy.” Today is a bitter reminder for those that survived the attack on the US naval base in Hawaii and the anniversary is traditionally marked by the return of some of them although sadly that number is dwindling. There will be a day in the not-to-all distant future in which there are no survivors still alive but December 7th will indeed always hold historical meaning and purpose and should not be forgotten. While it may have looked pretty it was a shame that the final game of the high school football season was played in conditions that were more suited for snow angels than football. Brick Memorial, who had scored 37 points just four weeks earlier in a win over East Brunswick, could not get anything going on a field covered by snow and lost the rematch to the Bears 9-0 Saturday. Neither team completed a pass during the Central Jersey Group 4 championship game at The College of New Jersey as heavy snow and high winds made even the simplest task very challenging. However as the saying goes…both teams had to play in it and Mustangs coach Walt Currie did not use the weather as an excuse. Our coverage of high school football on the Shore Sports Network culminates this week on our final “Thursday Night Football” broadcast at Boston’s Restaurant & Sports Bar in Toms River when we announce our All Ocean and All Monmouth County teams. Lacey Township High School will host a free College Showcase of High School Football this Saturday from 9am-3pm. The day-long event features a morning combine for high school players in grades 9-12 which is limited to the first 250 athletes and following that there will be a College Day presented by the Shore Coaches Football Foundation. Some 30 Division 2 and Division 3 colleges are expected to have representatives on hand to meet with athletes and parents between 1-3pm and talk about their programs, admissions, financial aid and more. • Almost 8 of every 10 men add some additive to their live tree in the hope of making it last longer. • 85% of men claim they will decorate more than ever this year, despite economic woes. • Finally if I were the Sherriff in town 8% of guys would be subject to fines. That’s the number who plan to keep their holiday decorations up until February. 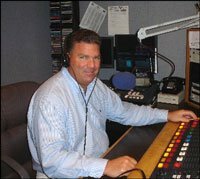 WOBM is many things to many people and while the world of radio has changed greatly since we first went on the air in 1968 one thing that remains is Ocean County will likely turn to us first during bad weather for storm-related information, including closings and cancellations. As we approach the winter season I am as a public service spending a moment this morning to alert you to changes in our Stormwatch program. This is especially important for those who are enrolled in the program as well as those wanting to find out how to get the word out during inclement weather. If you have listened to this station during winter mornings with bad weather you know what it’s like…well you know somewhat what it’s like. Shawn and Sue will often spend a good portion of their time telling you what’s closed, cancelled and delayed. In the old days this was done after we fielded hundreds of phone calls and as Ocean County grew this was no longer a practical way for us and you the listener. We have now gone to a web-based program which had glitches in the past but has been updated to what’s now a great 24/7 service to all. As for listeners seeking information there of course will be two ways for you to know whether schools and others are closed or delayed. You can visit our web site www.wobm.com 24/7 as once cancellations are reported they are posted. Or of course you can tune in to Shawn & Sue starting at 5am with the information updated throughout the day. I will tell you that not every detail of every cancellation will make it to the air but on line you can give a bit more information. Either way we’ll be there for you this winter like we have for more than 40 years. The recent story involving golf mega-star Tiger Woods brings up the issue of what separates public life from private life. Since the story first broke just about everyone has drawn some kind of conclusion as speculation has grown that Woods might have had an affair which led to domestic violence with Tiger himself on the receiving end. Who can’t picture in their mind Woods’ wife Elin with golf club in hand chasing him down the driveway. Tiger gets in his Cadillac Escalade and just as he begins backing up she smashes the club into the backseat window on the driver’s side. He floors it and moments later crashes into a fire hydrant and you know the rest of the story. Or do you? Tiger, who is a very private person even in the best of times, says this is very much a private family matter. He didn’t exactly say that in public but rather in a release that was posted on his web site that nobody believes he wrote but rather approved. He is now holed-up in his palatial estate in a very exclusive gated community just outside Orlando, Florida. Woods was to host his own tournament this coming weekend in California but Monday it was announced he would skip the event while he recovers from cuts and bruises from the accident. Of course most believe that was just his way to avoid the cameras and numerous questions that would have come with a public appearance. So far Tiger has also refused requests from Florida State Troopers to answer their questions but at some point he may have no choice. Of course this story has been on page one and all over the TV and radio not because there was a minor car accident but rather reports of another woman, infidelity and possible domestic violence. That’s the kind of stuff the golfing great has managed to avoid while building a bullet-proof image but the crows are circling and looking to feast on an ailing Tiger. You can be sure he’s been talking with those in his inner-circle and he can try to insist it’s all private but unfortunately he’s not only a public figure but it’s an adoring public that has helped make him a billionaire. The truth is we love flawed athletes and we’re anxious to give them second chances, i.e. Alex Rodriguez, Michael Phelps, and Michael Vick. Yet we have disdain for those who don’t beg for our forgiveness but rather hide behind a story nobody believes like Barry Bonds and Mark McGwire. Which category will Tiger end up in…only time will tell?